Lenovo Ultrabook Giveaway from Intel! Think you have to pay a hefty premium to get a thin and powerful laptop with good battery life? Not if you’re getting an Ultrabook™. Ultrabooks are a new class of ultraportable laptops that measure less than 21mm thick, get five or more hours of battery life, use a powerful Intel® Core i3™, i5 or i7 processor and wake almost instantly from a sleep state. All for around $1,000. Ultrabooks are the perfect laptop for people on the go, easily slipping into a bag or briefcase and barely noticeable from a weight perspective - you’ll find yourself bringing your laptop more places than ever before. With their ultra-slim profile, they’re also a dramatic style statement. We're giving away a Lenovo U300s ($1049 MSRP) to one lucky Techlicious subscriber, courtesy of Intel! Enter through February 24th, 2012 for a chance to win. Get your unique entry code and tell your friends about the giveaway via Facebook, Twitter and email. You'll get an extra entry for each friend who signs up using your entry code. We will randomly select one (1) winner from the entries. No purchase is necessary to win. The giveaway will end at 11:59pm on February 24th, 2012. Void where prohibited. U.S. residents only. Click here for the full rules. I have always had a desktop (currently it is a Lenovo - the best I’ve ever had!) I have never been able to afford a notebook computer - and until recently was never in a “wi-fi” position at home. I will shortly reach retirement age, and will be (frankly) busy paying off debts from this economy, so I will still not be able to afford a notebook on my own! I have looked at the tablets, but feel a notebook would be sooo much better! All I have is a tiny netbook and an old desktop model. I’s pass on the netbook to someone more needy than me if I were to win this. 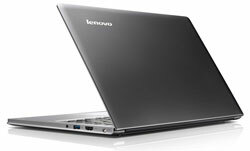 I want a Lenovo Ultrabook for my wife. She has a MAC desktop and I want to prove to her that an Ultrabook is just as good. I would love a new computer…I am a full-time teacher as well as a graduate student who is now battling my young children for computer time!! I could use the ultrabook for ME, when I am paper crafting in my room upstairs away from the computer. I could give the ultrabook to my oldest daughter, so she could take it to college in the fall. I could give the ultrabook to my younger daughter so she won’t be on MY computer all the time. I could give the ultrabook to my husband, because he would LOVE to be sitting on the couch watching TV and using a computer all at the same time! So many reasons….maybe the dog would want one too….? new technology is for me. I’m a computer nerd and new technology always gets me going. The new ultra book by Lenovo certainly fits that bill. I’d love to have one and experience what other companies will have next fall. I could use the new Intel-powered Ultrabook. With two daughters with heavy homework loads, they’re competing for computer time. This would be so helpful, not to mention bring peace to our house! We have an old netbook that just doesn’t make the grade anymore. This would be great for travel, and convenient to carry anywhere! I only have a little netbook and would love to have a new full sized laptop. My netbook is old and very sloooowwwww. Why I need a new Lenovo!! Why do I need a new laptop? I just do! I need a new PC and after using Lenovo at work I’ve come to realize how much of a good and sturdy machine it is. Very reliable. I think I need that in my personal life as well. Additionally I move around more and portability is a plus. I cam contemplating a work at home situation and my Dell Studio 1537 just won’t do the trick…and being on a fixed income, it would be hard for me to purchase a new laptop anytime soon, so this would be very much appreciated. I teach at a Catholic school, and having a dedicated laptop for my own use would be extremely beneficial. Instead of carrying around lots of paper (I’m a roving teacher) I could carry around a slim and light ultrabook with all my lesson plans, seating charts, handouts and projection material, not to mention easy internet access. I hope I win! My kids are always on my computer! I work from home and my kids are always sneaking on my laptop—not good! I would love to have this Ultrabook - either to keep for myself or for the rest of the fam to use. Sounds like it’d be great to take on vacation, too! I NEED a portable computer!!!!! I need a new ultrabook because I only have a desktop and need the portability of a laptop. I work from home, but I have LOTS of meetings for work where it would be so much more productive if I could have access to my files, etc. while at these meetings. I always have to take notes by hand, and then come home and retype everything on the computer. If I had an ultrabook, I could accomplish all of this in one step ~ WOW, that would make me a lot more productive, huh???!!! The ultrabook sounds wonderful ~ lightweight, fast, long-lasting battery, and portable ~ sounds like the perfect solution for me!!! Thanks for the chance to win!!! My laptop has started doing the “blinking out” thing….not a good sign! I have always wanted a laptop and this would be perfect for what I need it for. My 8 yeard old grandson is becoming very computer savvy but uses a computer over 6 years old. I would like to give him the Lenovo Ultrabook if I am fortunate to win one. Thank you for the chance. This ultrabook sounds like a great little laptop. My computer at home is Gateway from the mid 90’s and unbelievable slow compared to computer at work. Purchasing a laptop seems to always end up at the bottom of my list of “things I need to spend money on”. Thanks for the chance to win one. My Grandsons are taking over my computer! I want them to have their own! Hello, I need the Lenovo Ultrabook for my school library because I don’t have one at work. Due to budget cuts, technology is scarce around my building. Carrying my laptop daily on top of my other supplies is wearing me out. My students call me the “bag lady” because I’m transporting my various supplies daily. I would love to have one that I can use for work with my students daily! To be able to do my school homework on a sleek, lightweight laptop when I am traveling would be such a joy! Thanks for offering this sweepstakes. oooh! I need this for my husband - he can easily carry this around the house and for travel. His desktop is in really bad shape. The last time I was in the market for a laptop I had a choice and finally narrowed it down to 2 - a Lenovo and umm…. another brand. Unfortunately I got the other brand and along with it several years of regret. Since then I have recommended Lenovo to 2 other family members both of whom actually took my advice and have been happy users ever since. I’m still stuck waiting for my bad choice to just die so I can have a Lenovo too! My desktop is super OLD, and it would be so great to replace it with a new, sleek laptop. Hope I’m a winner! I bought a laptop just less than a year ago and it’s already giving me a truckload of problems. I bought a lemon. I don’t have the funds to purchase another one, so this would be a tech miracle/dream come true. Thanks for the opportunity! I would love to have this laptop because it’s super light and still powerful…I’d use it for school and my future career! I’d love a new Lenovo Ultrabook because I love technology and this computer looks elegant. It would be fantastic to win. I am self-employed and not having a Lenovo Ultrabook has handicapped me from getting worthwhile assignments, or to market myself to employers who require reliability, speed and the very latest technology. I could really use a new computer to do my homework on! I have a freelance business where I help people sort and catalog their receipts and bank/credit card statements in order to do their taxes. I go to their homes and offices so I need a light, working laptop. Mine is an older, heavier one and it would be great to have one this light and fast. Why do I need a new Intel-powered Ultrabook? For a lighter load on my back without sacrificing processing power! I NEED a new laptop! My current laptop isn’t even mine, it’s my sisters! Mine died a couple months ago from old age - no worries, it went peacefully in its sleep mode!! I have three gandchildren and we are always fighting for time on the pc that we have. It would be great for them or me to use and my pc is very old. Plus there are so many educational apps for them to use that would be great. My grandson has a speech problem and this computer would help him use apps for speech problem children. I am retired and really don’t have the spare money to buy one at this time. I would love to win the Ultrabook for the long life of the battery and quality of the product! I want to start working from home and need a new laptop that I can depend on, that no one else will use and can be devoted to my online job. My Grandsons use my computer for homework. I also have family that we have to travel to see and the portability of this computer would be great to travel with. I have a Mac at home but all work computers are pc - I could really use a windows based laptop to do my job! I need one because I don’t have a laptop and my pc is a few years old and needs updating. This would be a perfect solution because I can’t afford to buy a new one for quite a while. I stay after work do anything i need on their computer. I am a residential appraiser and since the economy or the real estate market decline, the soft ware i need to do an appraisal is requiring more and more space due to the requirements by FANNIE MAE and other lenders. Each of my reports contain over 30 pics and sometimes 50 plus. I just bought a computer less than a year ago and I didnot buy the least expensive and I am already running out of power and space. Oh my I could use it! I could use the Intel-Powered Lenvo to set up my new blog. I’m sure it wouldn’t have keys that stick and a big scratch on the screen that my current cheapo laptop has. Couldn’t believe that I had it a year and the case started falling apart. It isn’t so cute with duct tape holding it together…. My current laptop acts older than I am and is living on life support. Since I’m traveling more a new lightweight laptop would be perfect! I need a new laptop because mine is taking longer to start up in the morning than me! I need this so I can do my work!